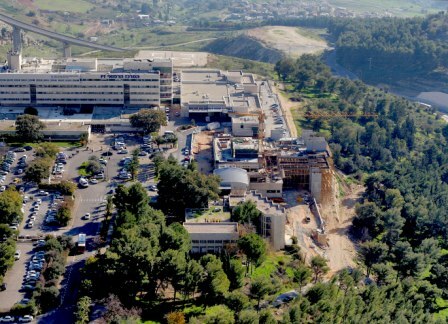 The Ziv Medical Center, a general hospital in northern Israel, is the only hospital serving the 250,000 residents of the Upper Galilee and northern Golan Heights, IDF and UN soldiers based in the area and hundreds of local and foreign tourists to the region. Ziv's patients come from Israeli towns, villages and agricultural settlements and include Jews, Muslims, Christians, Druze, Circassians and Bedouins as also reflected in its multiethnic medical staff. The hospital's greatest challenge is to provide its patients with the best possible up-to-date professional treatment while decreasing current inequalities in health and access to health services between the northern and the central areas of the country. With the opening of the Bar-Ilan University Faculty of Medicine in the Galilee in 2011, the Ziv Medical Center has the added task and privilege of providing the teaching and clinical base for the Faculty's medical students. Ziv's unique physical location in the north, an aerial distance of 11 km (7 miles) from the Lebanese border in the north and 30 km (19 miles) from the Syrian border on its east, makes it extremely vulnerable to conventional and non-conventional attacks, as experienced in the Second Lebanese War in 2006, when the hospital was targeted and hit a number of times.